It seems that tensions between North Korea and the United States as well as China may have just hit another level, as it appears North Korea has unveiling powerful new missiles on Saturday. North Korea is celebrating their founder’s birthday, Kim Il Sung, who instituted the Kim Dynasty 105 years ago. This is a traditional celebration that is done every year, but this year eyes were on North Korea big time due to rising tensions over nuclear weapons it was assumed they had. North Korea had everything to celebrate from troop formations to the missile displays and armed vehicles that rolled through the huge Kim Il Sung Square in Pyongyang. Kim Jong-Un, the nation’s current leader, watched on from a balcony and gave an occasional nod or salute to the thousands of North Korean men and women watching on. April 15, known as the “Day of the Sun” for North Korea, is quite significant to the nation. This was a big day to celebrate their founder, but it is also a fantastic time to debut their military power and big technological advances. One of the major debuts on Saturday was the Pukkuksong-2 SLBM. It is a submarine-launched ballistic missile, which was loaded on trucks according to Reuters. This parade came as rising tensions had been underway with pretty much the entire world. North Korea certainly started some issues with the United States as of late. There has been threats for years by Kim and his father about attacking nations and things rarely go down. However, the latest comes as North Korea has proven to have artillery to execute the threats. They even did a test not too long ago. This started to get the attention of everyone, including the United States. The next possible Nuclear test, the sixth in total, may cause problems. Many feel this would be a terrible situation, but it is something that North Korea tends to not understand. Several countries do not like North Korea and many have called for them to be removed. The United States is just one of many nations North Korea has threatened over the years. China wants to avoid any strike that a country may make against North Korea simply because they enjoy the buffer North Korea provides them from the West. They do not want to see a united, democratic Korea run by the leaders of South Korea. This would have United States influence, and China does not want to deal with this. It very well could be why China has remained North Korea’s biggest economic partner. However, as of late, China is slowly moving away from North Korea as a sign to tell them to halt what they are doing or they will move away from them entirely. North Korea cannot afford to lose China, so many believe North Korea will end up calming down and moving away from their plan of an all-out war. The United States, nor any other country, want to go into war with North Korea, as it would most likely end up in a nuclear issue. However, with no ally for North Korea involved here, even China….it would be a difficult war for North Korea to win. The United States Military is so large it would be able to handle North Korea on its own. 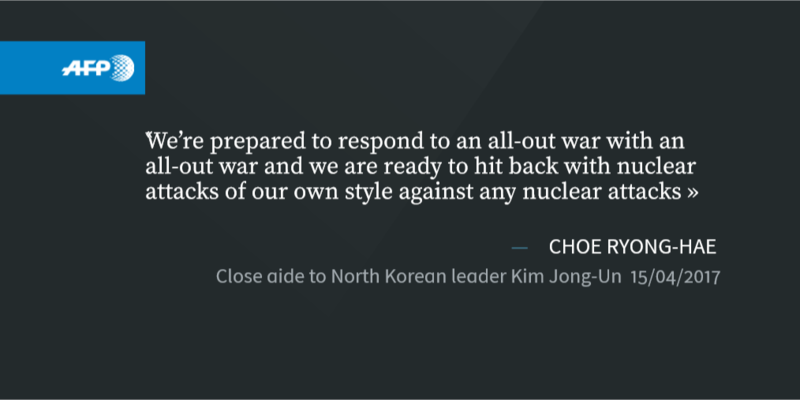 However, the only reason the U.S. would strike is if North Korea does decide to move forward with its testing or plans to aim at the U.S. or one of its allies. It’ll be interesting to see if North Korea withholds from attempting anything. It seems China is trying to send them the message of not continuing, but with their latest debut and plans still underway to do their test…it is uncertain if they care about the consequences or they think there will be none.